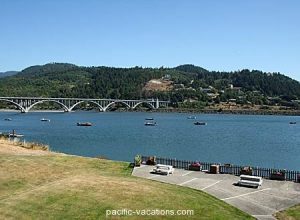 Harborview is a lofted one bedroom condominium overlooking the Rogue River and the Port of Gold Beach Harbor. It has scenic views of the Magnificent Rogue River Bridge, and the mouth of the Rogue River as it flows into the Pacific Ocean. This nicely appointed one bedroom / one bath condo can comfortably sleep up to two adults in the lofted bedroom, and additional people on the comfortable futon sofa on the main floor. In addition to the scenic harbor and river views, the condo features a private balcony, a wood burning fireplace, a nicely equipped kitchen, and all linens are provided. to reserve this fabulous vacation rental home!